The US Naval Sea Systems Command (NAVSEA) has awarded a contract to iRobot for providing semi-autonomous capability upgrades to its 248 transportable robotic system (MTRS) MK1 MOD 1 units. Under the $7.7m contract, iRobot will provide Aware 2 software upgrades for the robots and deliver advanced sensor suites, which include iRobot wide-angle robot vehicle vision system (iWARVVS) camera, thermal camera and iRobot’s user assist package (UAP). The cameras have been developed to provide greater situational awareness with enhanced fields of view and imaging in low-light environments. iRobot’s Defense & Security business unit interim general manager Tim Trainer said: "These upgrades will provide our troops with some of the most advanced, life-saving robotic technologies available today." "iRobot’s UAP improves mission effectiveness, while reducing workload and further minimising operator exposure to dangerous environments," he said. "These upgrades will provide our troops with some of the most advanced, life-saving robotic technologies available today." 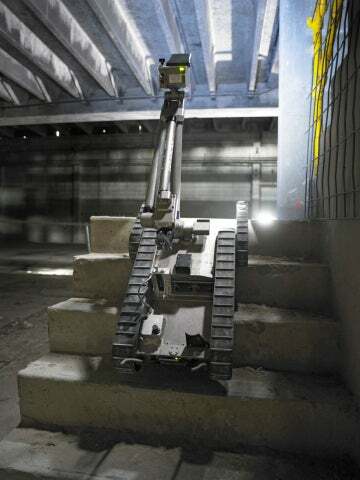 Developed after the iRobot 510 PackBot, the combat-proven MTRS MK1 Mod 1 robot has been designed to perform search, reconnaissance, bomb disposal and other missions, while safeguarding soldiers in the battlefield. The user assist package will provide 510 PackBot with improvements to operator control unit, GPS mapping and critical semi-autonomous features, as well as self-righting, retro-traverse and heading hold. In addition to reducing the operator’s workload, the upgrade capabilities for the robot are expected to enhance operation speed, while allowing the operators to focus on mission success. More than 4,500 robots have been delivered to military and civil defence forces by iRobot to support search, bomb disposal and other missions. Deliveries under the contact are scheduled to be complete by November. Image: iRobot-built man transportable robotic system (MTRS) MK1 MOD 1 robot conducting mission. Photo: courtesy of iRobot Corporation.